It's been 40 years since Stuart Spector first introduced his hand-crafted basses to the world - amassing an artist roster including Doug Wimbish, Alice In Chains' Mike Inez and the E Street Band's Garry Tallent along the way - and a new limited-edition model celebrates this anniversary. 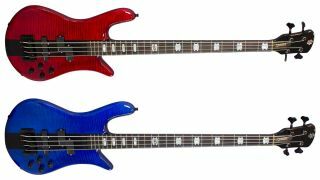 Available in red and blue stain gloss finishes, the bass features Spector's classic solid maple Euro outline, with neck-through construction and a graphite-reinforced truss rod, 24-fret rosewood fingerboard and 40th Anniversary 12th-fret inlay. Custom-wound Bartolini and EMG pickups are behind the sounds, while Spector's Tone Pump preamp circuit provides extra tonal muscle. The Spector Limited Edition 40th Anniversary bass is available now for £2,340.